This photo is taken in Northern Territory, Australia. One of the "prison trees". The big trees gets hollows, which makes it impossible to tell, how old they are. Probably between 500 and 1000 years! The seedlings in Copenhagen Botanical Garden. It is possible to see the thickened stem. 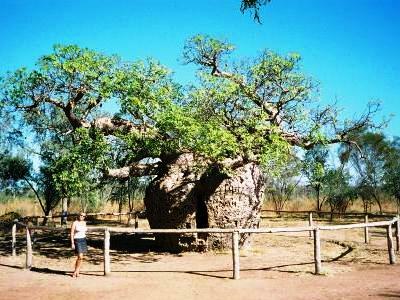 The big and beautiful tree appears only in the northern part of Australia. Given this name by Ferdinand Jacob Heinrich von Mueller in 1857. 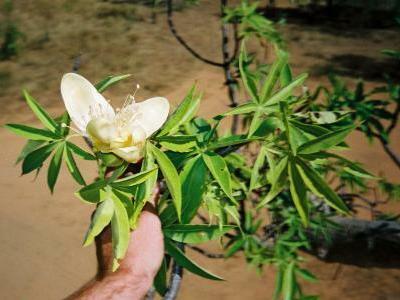 It belongs to the Bombacaceae* family. The trunk will get op to 5 meter wide and the tree up to 20 meters high. 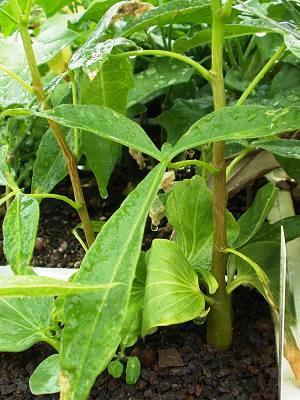 It can be reproduced by cuttings and seeds. Grows best in grit, lots of water and sun in summer and dry in winter. I found some seeds in Derby in 2002. There are 6-10 species of Adansonias on Madagascar, one in Africa and this one in the Kimberley region (Northern and Western Territory), Australia. 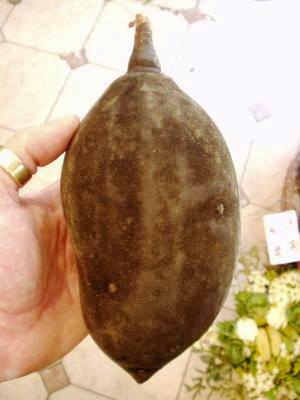 It has gourd/egg-formed green fruits, which can be 18 cm long, with several seeds in a vitamin C hard-foam. Well, I got some seeds, but they didn't seem to germinate. Gave most of them to Copenhagen Botanical Garden, and they had more "luck". Some boil or frieeze them, but they didn't. I done some additionally experiments, and most successful by far it simply to throw them into a cup of 90C hot water, and leave them cooling in for 24 hours. Gave me 100% against 0%. Named after the French naturalist Michel Adanson (1727-1806) and explorer Charles Augustus Gregory (1819-1905) by Ferdinand von Mueller in 1857. Conningham called it Capparis gibbosa in 1820, but the gregorii persisted as its official name. The big and beautiful flowers appear mostly at night.